For people with Type 2 diabetes, it is important to keep your glucose levels under control to avoid long-term complications. There are several ways you might manage your glucose levels with Type 2 diabetes. While a person with Type 1 diabetes requires insulin injections or insulin pump therapy to manage their diabetes, somebody with Type 2 diabetes might be able to manage their glucose levels via a diet and exercise plan or oral therapy. After initially being diagnosed with Type 2 diabetes, your doctor may prescribe a diet and exercise regime if your diagnosis was caught early. They may also refer you to diabetes educator or dietician who can support your regime, to assist you in keeping your glucose levels under control. However, lifestyle changes may not be enough to control your glucose levels and it may be necessary to take oral medication or insulin. Find out more about carbohydrate counting, nutrition and eating with diabetes. If your doctor has prescribed a diet and exercise plan and it has not led to better glucose control or your diagnosis was later, oral medication may be used. There are a number of oral medications available to manage Type 2 diabetes. Some oral medications may lower the level of glucose in your blood, increase your insulin levels or do both. Sometimes your doctor might prescribe a combination of these medications and could prescribe insulin in addition to oral medication. If oral therapy alone is unable to successfully control the glucose levels of a person with Type 2 diabetes, insulin may then be prescribed. Insulin can be delivered via daily injections or via an insulin pump. A MDI regimen consists of a minimum of four injections per day. The regimen includes one injection of long-acting insulin in the evening and an injection of rapid or short-acting insulin before each meal. 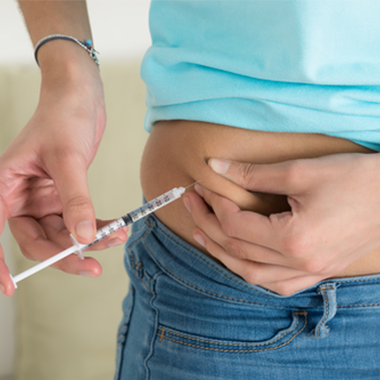 Long-acting insulin is designed to release slowly and evenly in the bloodstream for about 24 hours after it is injected. It acts like the background insulin in a person without diabetes. Rapid or short-acting insulin acts like the insulin released around mealtimes in a person without diabetes. This insulin is injected before meals. The amount of insulin taken should be adjusted to match the food in the meal, using the insulin-to-carbohydrate ratio. Learn how you can achieve fewer injections on MDI. Insulin pump therapy mimics the insulin delivery of a normal pancreas more closely and replaces the need for frequent injections by delivering precise doses of rapid-acting insulin. Only one insertion of an infusion set is required every 2-3 days. Sensor Augmented Therapy can alert you to dangerous high or low glucose levels, allowing you to take action and potentially prevent complications. Find out if insulin pump therapy is right for you or hear Patrick’s story. 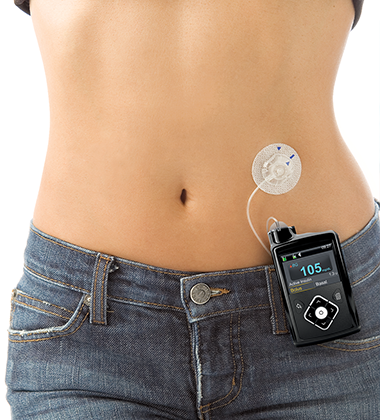 When insulin pump therapy is paired with CGM and therapy management software, glucose levels, hypoglycaemic episodes and glucose fluctuations are further lowered1. 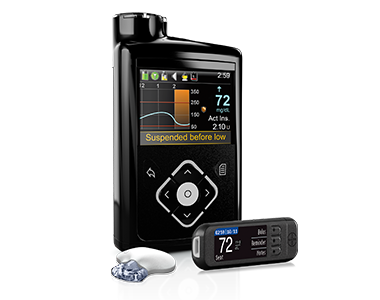 How does Insulin Pump Therapy compare to MDI? Only MiniMed insulin pump therapy is demonstrated in clinical studies to reduce A1C better than multiple daily injections for people with Type 2 diabetes1. Studies have shown that A1C reduction can significantly reduce the occurrence of long-term complications6,7. 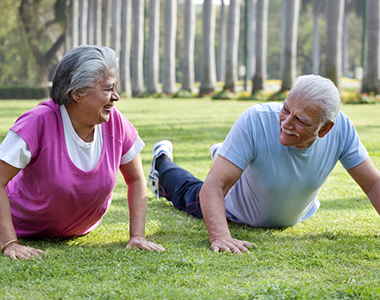 Check out our tips on eating, exercise and alcohol. It’s also important to take care of your mental health. If you’re worried that you might be depressed, your doctor or a health professional can help you. You can also contact Diabetes Online Counselling or Vandrevala Foundation for help. IS INSULIN PUMP THERAPY RIGHT FOR T2 DIABETES? Prevalence of impaired awareness of hypoglycaemia in adults with Type 1 diabetes. Geddes J, Schopman JE, Zammitt NN, Frier BM. Diabet Med. 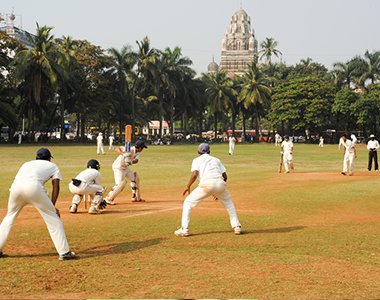 2008 Apr; 25(4):501-4. Reznik Y. Cohen O. Aronson R. et al, Insulin pump treatment compared with multiple daily injections for treatment of Type 2 diabetes (OpT2mise): a randomized open-label controlled trial. The Lancet 2014; published online July 3. Lynch PM, Riedel AA, Samant N, Fan Y, Peoples T, Levinson J, Lee SW. Resource Utilization With Insulin Pump Therapy for Type 2 Diabetes Mellitus. Am J Manag Care. 2010;16(12):892-6. Bode BW, et al. Reduction in severe hypoglycaemia with long-term continuous subcutaneous insulin infusion in Type 1 diabetes. Diab Care. 1996;19:324-327. The Diabetes Control and Complications Trial Research Group. The effect of intensive treatment of diabetes on the development and progression of long-term complications in insulin-dependent diabetes mellitus. NEJM. 1993;329:977-986.